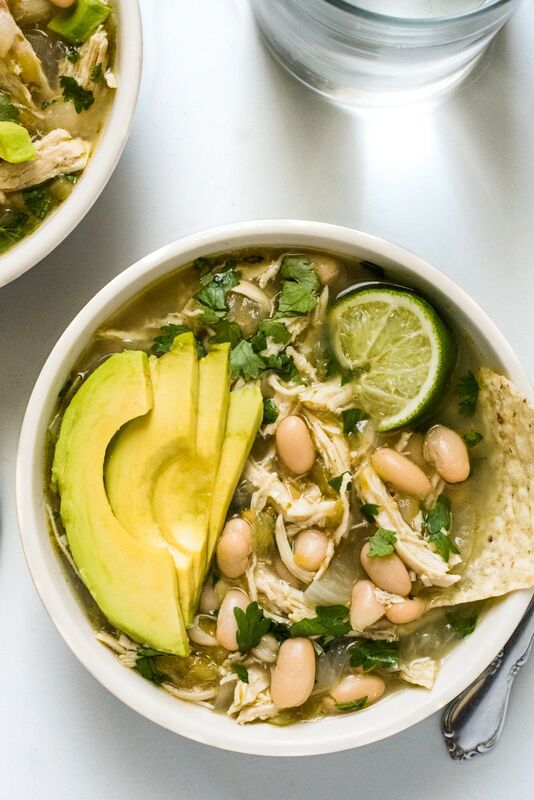 This hearty White Bean Chicken Chili Verde Soup is a comforting one pot meal made with salsa verde that’s naturally gluten free and perfect for the whole family! What’s healthy, filling, easy to make and requires only one pot from start to finish? Hint hint – you’re looking at it right now! 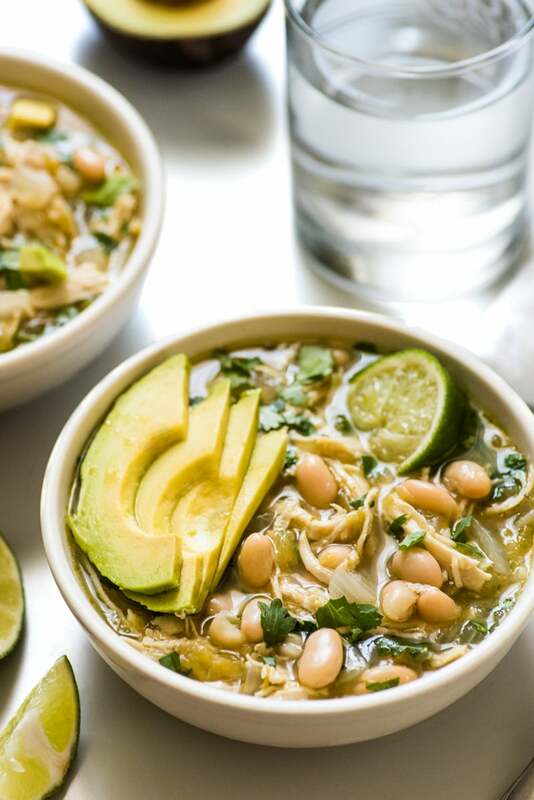 This White Bean Chicken Chili Verde Soup is full of some of my favorite flavors – creamy and hearty white beans, tangy and slightly spicy salsa verde and savory onions and garlic. 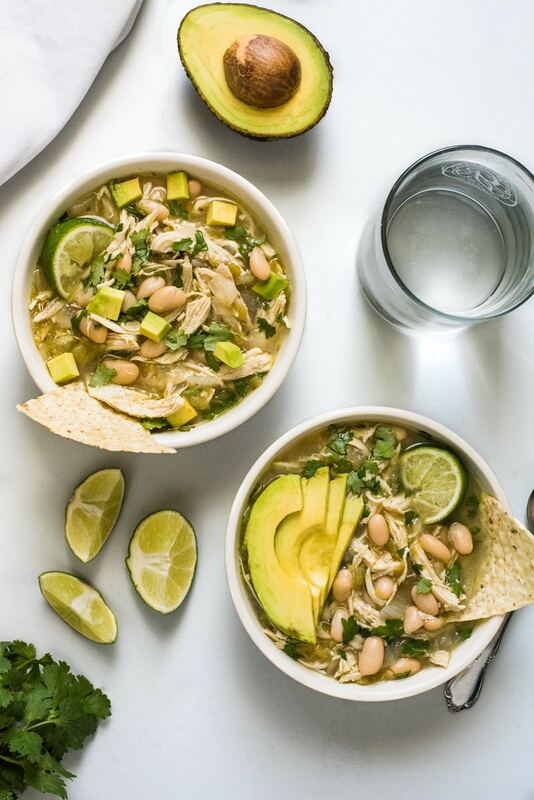 Topped with some freshly squeezed lime juice, cilantro and avocado, this comforting bowl is sure to keep you full and satisfied for hours until your next meal. I want to get a little personal for a second. I haven’t been doing as much cooking as usual these past couple of weeks due to a very sad family event. Because of everything that has been going on and how I’ve been feeling, I decided to take a little breather from posting and instead focus on spending time with loved ones in Oklahoma City. This soup is the first dish I’ve made for the blog since everything happened, and I’ve gotta say it was really comforting to cook and take photos and try to focus on something else to take my mind off of everything, if only for a little while. Cooking is like my yoga, my meditation, my stress relief and my passion at the same time. I’m so lucky I get to do it three times a day or even more if I want to. And I’m lucky that people like you actually want to see what I’m cooking and creating in my kitchen. Enough mushy gushy stuff, let me tell you more about this soup! 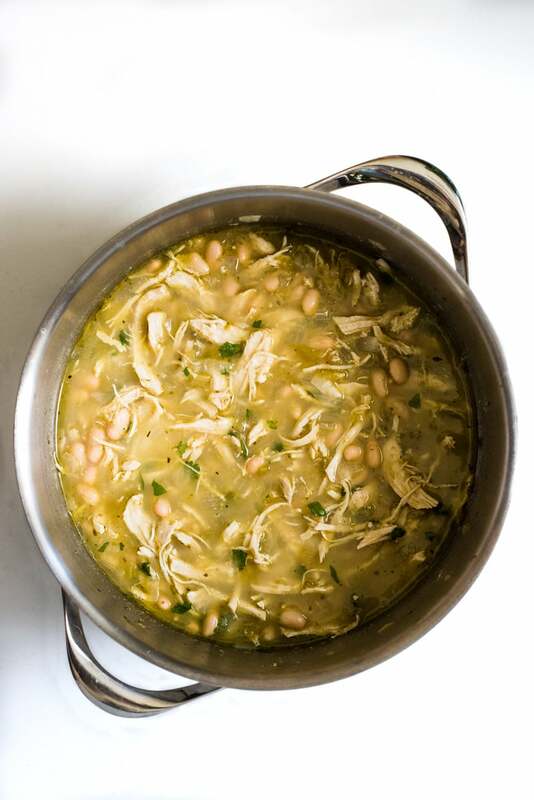 One of the best things about this white bean chicken chili is that it’s extremely versatile. You can follow the recipe as it’s written, or you have two other options – the under 30 minutes version or the slow cooker version. To make this recipe in under 30 minutes, you can use pre-cooked shredded chicken that you have leftover in the fridge or a store-bought shredded rotisserie chicken. Simply sautee the onions, garlic and green chiles according to the recipe below, and then add in all the other remaining ingredients including the shredded chicken to the pot. Cook uncovered for 20 minutes and that’s it! To make this recipe in the slow cooker, place all ingredients except beans in the slow cooker. Cover and cook for 4 hours on high or 6 hours on low. 30 minutes before it’s ready, add in beans, cover and cook for 30 more minutes. Remove the chicken from the slow cooker, shred with a fork on a plate and transfer shredded chicken back to the slow cooker. Mix together and serve. 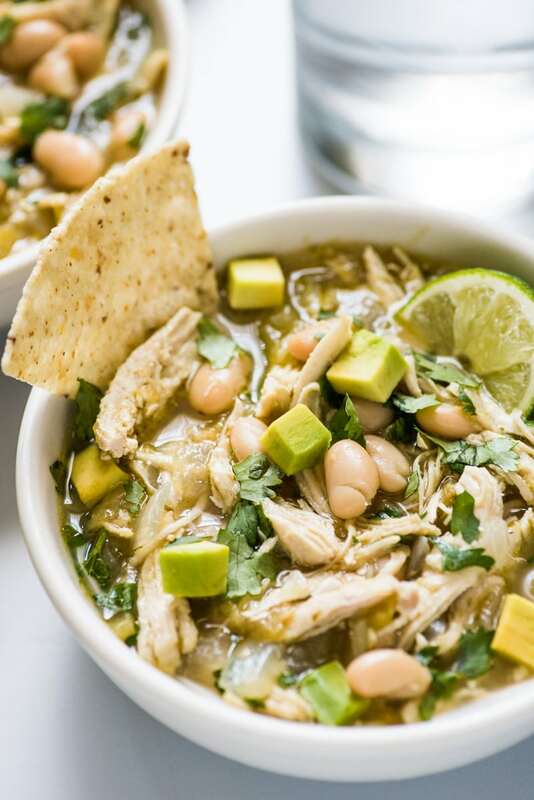 Pair this soup with a Mexican Bolillo Bread Roll or these Homemade Lime Tortilla Chips and you’re good to go! In a medium pot or Dutch oven, heat oil over medium high heat. Add onions, green chiles and garlic and saute for 5 minutes until onions have softened and become translucent. Add chicken breasts, chicken broth, salsa verde, cumin and dried oregano. Mix together, cover and cook for 45 minutes. Remove chicken from pot and transfer to a plate. Shred chicken with a fork and transfer shredded chicken back into the pot. Add the white beans and cook uncovered for 15 more minutes. Serve with freshly squeezed lime juice, chopped cilantro and other toppings like shredded cheese, sour cream and tortilla chips. *Nutritional information does not include garnishes. To make in the slow cooker: Place all ingredients except beans in the slow cooker. Cover and cook for 4 hours on high or 6 hours on low. 30 minutes before it's ready, add in beans, cover and cook for 30 more minutes. Remove the chicken from the slow cooker, shred with a fork on a plate and transfer shredded chicken back to the slow cooker. Mix together and serve. To make in under 30 minutes: Substitute the chicken breasts for leftover cooked shredded chicken or a store-bought shredded rotisserie chicken. Simply sautee the onions, garlic and green chiles according to the recipe and then add in all the other remaining ingredients including the shredded chicken to the pot. Cook uncovered for 20 minutes and serve. I made this with roasted pheasant and it was so beyond delicious! I used either TJ’s chili verde or Herdez, but can’t remember plus, added carrots, celery and kale. Thank you so much for sharing this very delicious recipe! I’m sharing it in an action basket that I’m creating for my daughter’s annual school crab feed. Enjoy your new home! Ooh, roasted pheasant in this chili sounds so good! I’m so happy you enjoyed it. And thank you for the well wishes! Things are going really well so far! Has anyone made this using soaked dry beans? Wondering what the cooking time would be and how much extra liquid I’l need. Thanks! Did I miss when you put the beans in? They’re added in Step 3, after you add in the shredded chicken. Hi Satina! Haha, totally understand 🙂 The nutrition information does not include the garnishes. Sorry! I’ll be sure to mark that in the recipe. Thanks for asking! Made it, loved it. I blended half of the bean mixture to make it creamy as I am dairy free and it was great. Made this intending to eat on it all week, but it was gone the next day! My husband and I are on a huge green chili kick and have a go-to white bean chili recipe that is cheesy, addictive, and probably terrible for you. This one was so good, flavorful, and easy to make (also, nutritious and actually good for ya!) that it has surpassed and replaced our old “white chicken chili” recipe! Can’t wait to make it again this week. Currently drooling. And daydreaming of chili weather. All kinds of excited right now! I MUST try this! Chili weather is definitely the best! I’m in Switzerland so not familiar with what exactly you mean by a tin of green chillis – what sort of chillis? Do you use a certain brand? Would love to make this soup! Here’s the kind of green chiles that I use – http://amzn.to/2wqO4yP . I hope this helps!